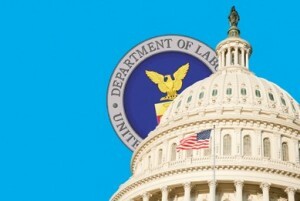 On Wednesday, April 6, the U.S. Department of Labor (DOL) released a final rule expanding the number of persons that are subject to fiduciary standards when they provide retirement investment advice, including exemptions that would allow advisers to continue to receive payments that could create conflicts of interest if certain conditions are met. Federal law protects plans, plan participants, and IRA owners by requiring all who provide retirement investment advice to abide by a “fiduciary” standard. Among other responsibilities, fiduciaries are required to act impartially, provide advice that is in plan sponsors’ and plan participants’ best interests, and are not permitted to receive payments creating conflicts of interest without a prohibited transaction exemption (PTE). Because large loopholes in the current definition of retirement investment advice make it hard for individuals to determine whether such advice is being given in their best interest, the DOL’s new definition provides that any individual receiving compensation for providing advice with the understanding that it is based on the particular needs of the person being advised or that it is directed to a specific plan sponsor, plan participant, or IRA owner is a fiduciary. Retirement education: Providing general education on retirement saving does not trigger fiduciary duties. Education (as defined in the rule) will not constitute advice regardless of who provides the educational information (e.g., the plan sponsor or service provider), the frequency with which the information is shared, or the form in which the information and materials are provided. Transactions with plan fiduciaries with financial expertise: Fiduciary obligations are not imposed on advisers when communicating with independent plan fiduciaries if the adviser knows or reasonably believes that the independent fiduciary is a licensed and regulated provider of financial services (banks, insurance companies, registered investment advisers, broker-dealers) or those that have responsibility for the management of $50 million in assets, and other conditions are met. Internal employee recommendations: Employees working in a company’s payroll, accounting, human resources, and financial departments who routinely develop reports and recommendations for the company and other named fiduciaries of the sponsors’ plans are not investment advice fiduciaries if the employees receive no fee or other compensation in connection with the recommendations beyond their normal compensation for work performed for their employer. Among other PTEs, a new “best interest contract exemption” allows firms to use certain compensation arrangements that might otherwise be forbidden so long as they (among other things) commit to putting their client’s best interest first, adopt anti-conflict policies and procedures (including avoiding certain incentive practices), and disclose any conflicts of interest that could affect their best judgment as a fiduciary rendering advice. Compliance with the new requirements will not begin until April 2017, with certain exceptions. For example, the best interest contract exemption will be phased in during a transition period from the April 2017 applicability date to January 1, 2018, under which fewer conditions will apply. Click here for more information, including a fact sheet and FAQs.